Thank you all for your comments on the summer giveaway post. They all certainly helped me get into the spirit of summer. 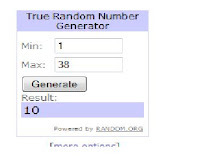 The winner as provided by Random.org (I used numbers 1-38, one for each comment), is Ashley from Writing To Reach You! I used her comment in my last post but its so perfect, here it is again: "My favorite thing about summer is that I always have this unreasonable hope that my life is going to get exciting and movie-like for 3 months--that I'll be swept away--and even though it never happens, I always have the hope." Ashley, please send me your address and I'll get your box out to you soon. I hope you all continue to enjoy your favorite things about summer! I wanted to win! Hope you had fun at the concert! A contest! Damn it, see what I miss while I'm away. She definatley deserves to win, that it is a great quote. It sums up how I feel every summer. What? Oh my gosh, really? How awesome! I never win anything. Thanks Mandy. yayyy for the big winner! Curses. I'll get you next time Random.org. I was hoping I would win and then that would mean my luck was turning around....maybe next time!!! Sorry I have been MIA...just not with it yet. I'm getting there, making progress, just not back to "ME" yet. Thanks for all of your support through this!!! I truly appreciate it. I'm still in love with that expression. SO true.